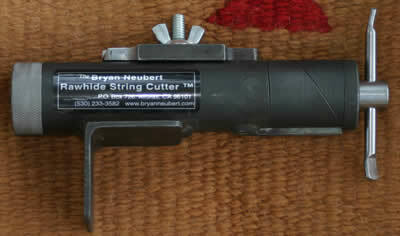 This string cutter can be used for cutting either rawhide or leather strings for braiding and buttons. It is designed to be locked in a vice and to cut very precisely the exact size strings you may need and to take of the exact amount of edge from the string to make your work look as professional as any string cutter can. It is closely related to the string cutter featured in the video Introduction to Rawhide Braiding , only smaller, therefore, about 1/3 the cost. It is designed to be used with single edged razor blades, available at any hardware store. Price: $400, plus $15 shipping and handling. California residents add $29.00 (8.25% sales tax) Please call for out of US postage. B & P Neubert Enterprises, Inc. PO BOX 726, Alturas, Calif. 96101. Call 530-233-3582 for any questions. 2006 Patent Pending. Copyright © 2019 B&P Neubert Enterprises Inc.